Calculate the grades you need to meet your goals. -The High-Level GPA Scenario Calculator allows you to approximate how achieving a certain overall level of performance (e.g., all A's, some A's/some B's, etc.) will impact your cumulative GPA at various points in your high school career. 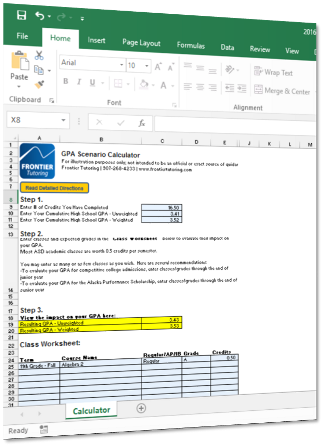 -The Detailed GPA Scenario Calculator allows you to make more exact calculations about your future GPA based on grades in specific courses, including AP/IB weighting. -The Goal Seek GPA Calculator tells you what grades you would need to maintain going forward to achieve your target cumulative GPA by the end of your junior or senior year.